Teens 12-18 face so many dangers these days even when we think they are being sheltered. Karate is an excellent discipline for teens during these trying years of change and growth. Creating a fit body and pushing home that the body is a precious tool to enable us the freedom to do what we want to do in this world and is ours for life. We push home the need to keep that body working well regardless what dimensions we are handed. Our bodies all improve after solid, consistent training. Giving them a different “cool” thing to do is going to promote a sense of routine activity. It is expected there be consistency to their training, so no time to make excuses ? Plus they are doing this for themselves not someone else thus promoting an understanding of commitment. Learning respect and allowing someone to have authority over them in the teenage years is generally met with distain to one degree or another. The confine of a “society” within the dojo allows nothing less than complete respect from young to old, male or female. The hierarchy in our “society” is set on a knowledge base, the belt system. Under this system all ages are the same. No one is excused. Adults can’t assume power over the younger students and neither can the younger students assume power or show disinterest toward the adults. Almost the only time students will find an unbiased playing field in this world. Sport will save many a teen from getting involved in drugs. Karate takes that up a notch, with the base of respect (not only for others but yourself). There is a personal need to perform plus this sport is not seasonal, there is continuity throughout the year thus not giving empty time when other negative exploits can be sought. That old phrase ‘your body is you temple” may seem cliché but is the underlying truth in. Socialising is generally uppermost in the average teen’s minds. They crave it and they need peers to compare “the norm” on unchartered territory, such as their bodies, minds and environment because they and their ideals are changing so rapidly, they need social interaction to grow into well-balanced adults. The trick to success here lies in the pathway they choose (or are directed in). A common mistake parents make is to try and alleviate the stress & pressures of heavy study workloads by cutting an activity, and this commonly is a sport. The parent, in a desperate attempt to aid their child gain more time to fit in the heavy work load, takes away the very tool that enables them the release to gain the focus to fulfill it. 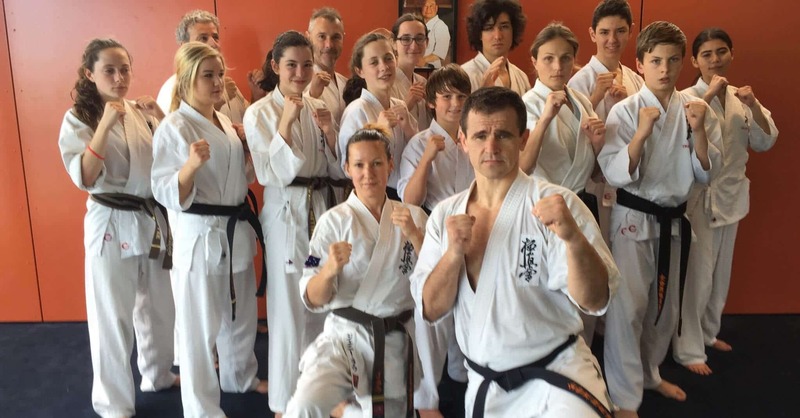 Trifu Dojo gives them an avenue to maintain an interest in physical activity and thus rejecting a need to find negative activities to fill a void. Giving them not only feel good exercise but also the ability to socialize with other teens that have a positive objective. Why would a teenager like our classes? Teens can use up energy with a team spirit but has individual positive self worth benefits. Karate uniform equalizing the need to “outdo” others in the class. It is a leveler between size, gender and race. Opportunities to travel & compete in competitions. Teenagers who get involved in martial arts reap numerous benefits. One of which is the physical benefits where they practice punching, kicking, blocking, jumping and running during class.